Cattle Guards are custom-built and are available in Pipe-on-Rail and Rail-on-Rail styles. Since our cattle guards are built on site, we can manufacture any width that is needed. In-stock cattle guards include 8’x16’ and 8’x20’ in both Pipe-on-Rail and Rail-on-Rail varieties. Concrete Cattle Guard Beams are sold in pairs and available in 12-foot, 16-foot and 20-foot lengths. The concrete beams are constructed of 5000-pound concrete with ½’’ rebar and are extra-heavy duty. The dimensions of the beams are 16"x16" with an 8"x9" corner cut out. 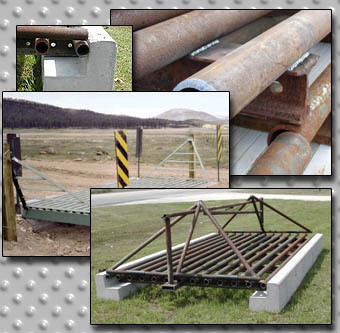 Our cattle guards can accommodate beams, wings, gates, barrel locks, and other accessories. Shipping and installation is available.